I somehow, don't remember at all, how or why I wound up looking at Pinafore's. I wish I could remember what led me to look at them, but once I did I was enchanted.....enchanted with a quaintness and a practicality that I could not resist. These criss cross aprons are inspired from Japanese working aprons, also called mobius aprons, but these are called by many names now. Many hours later, many days later, and falling in love with various styles etc, I realized I wanted one. I looked and looked at it. It looked simple enough, but still there was something about it I could not figure out. Mind you I am not a seamstress, nor do I know how to sew and abhor patterns. I simply study something, try my best to figure it out, and then gingerly cut my material and sew it together and make adjustments. I have a simple sewing machine and all I can do on it is straight or zig zig stitches. I marvel when I see those who have sewing machines that do all kinds of things with names I have no clue about, a language that is altogether foreign. So here I am trying to figure out how to sew this and I am stuck on a point about the criss cross as the entire garment is seamless! I want to just slip an arm in on one side then the other and be done! Ease and grace, love it....but it didn't work this way. I saw a short video clip about how to put this on and you have to find the center point, slip it over your head, then each arm through the openings, then straighten. This is where the criss crossing started happening in my brain and I got dizzy. Anyway, I realized once again, though I try to reverse engineer a garment I eventually have to do it my own way, and so it was with this. And I did make one mistake which will be apparent in a minute. But the process was and is simple, very simple, and if one were to get into making these, like I'm thinking of doing, it could go like a breeze. Eventually. I measured how long I wanted it, and I thought above my knees is good as I dont like things getting stuck in movement there. I had some ticking fabric I got from Walmart which I loved with the thin brown pinstripes and knew it needed to have something to do with the kitchen and culinary arts lolol. So it had to be that. So I made those decisions, cut a basic square, then the straps which criss cross. I measured the straps on the dressform to be 18". I cut and sewed. This was a mistake in measuring as though it looked OK on my dressform, I am a full size larger than it, and I forgot to factor that in, so I had to cut 5" more for each strap, so they should have been 23" long each. I like things loose too.....easy on and easy off. See the frayed edges? the fabric has this on both sides, I wanted to leave them. Also is less sewing. I pinned the top and sewed that. Lets just imagine these two pieces are 23" long each.....these are the straps which hold the pinafore up and criss cross in back. I wanted them wider rather than thinner for the classic look, so I folded them over in half and sewed them to 3" wide. I went to the dress form, pinned the pieces together then tried it on. The longer straps were great, the longer the better IMO....then sewed the straps. To place the straps on the pinafore, the back was the most important as I wanted the edge of the strap to line up with the edge of the pinafore. I also cut out two pockets (no pics), by placing my hand on the fabric seeing how much fabric it took then added a couple of inches, making sure the frayed edge was the top part opening, and cut. I like spacey pockets. I cut two pieces 8" wide, almost square. Then while wearing the pinafore I placed my hands where I wanted the pockets to be, placed the cut outs there and pinned. Then removed the pinafore and evened the placement of the pockets then sewed. Here is the finished pinafore, which should only take half an hour next time. But next one is going to be a romantic one, made in linen and have ruffles....ala Magnolia Pearl, the white one above. But I did want this simple thing. The ticking is a bit of a stiff/non flowy fabric, not like linen, but it is soft and good to use for many things including gardening. I will be making a few more. This is the "prototype". lolol. The ways that one can be creative with these is absolutely endless! 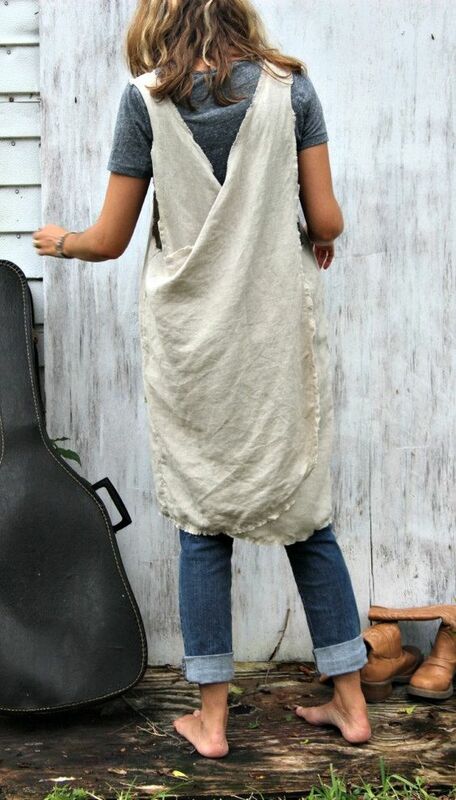 See how the edge of the strap lines up with the edge of the pinafore? Also frayed edge to frayed edge? these are details and details are important. And yes the stripes need to be lined up and these actually help with sewing straight. I love how this criss cross back is so adjustable to many sizes.....its open and the longer the straps the larger it can be. No ties, simple......luv it. To point out my mistake, the seam on the left strap? that is because it was too short. I had to cut another 5" to make them longer, and it worked. I don't like the seams but I will forget it shortly. This garment has been washed and is so soft and I do like wearing it. 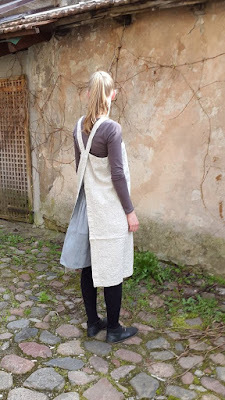 I think everyone needs at least one of these, they're so easy to make, basically a large square and two rectangles.......plus 2 squares for pockets.....and it is so versatile, I can work in it, and even go out shopping in it, its a very cool thing. I can see a future of wonderful beautiful sweet aprons!xxxx you clever lady you! Just lovely! I also have been enamored with the pinafore for as long as I can remember. 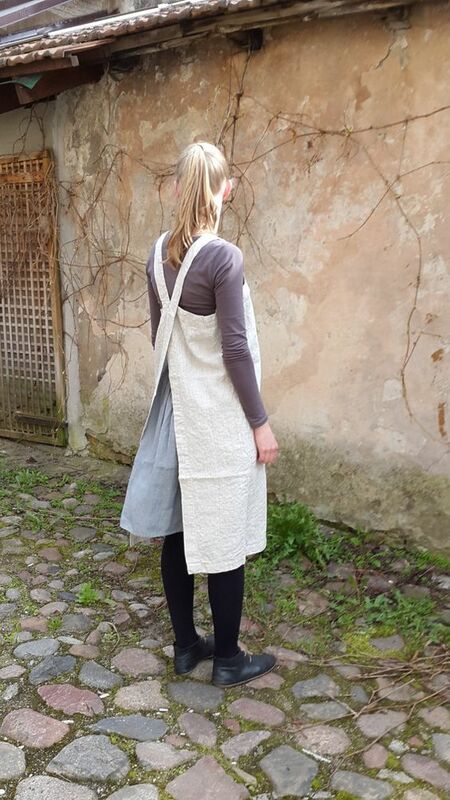 I wanted to make one as a gathering apron for veggies from the garden, but have not done so as yet! I am like you, I really don't like using patterns. I would much rather let the fabric guide the way in turns out! thank you for the lovely inspiration. Hello, You did a great job and you figured out a way to make it work for you. 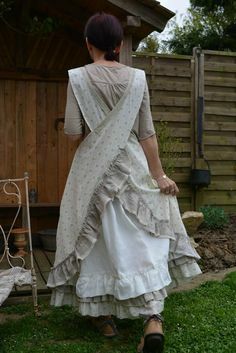 I loved the stripped fabric and leaving the edges make it look vintage. I would love to make myself one! 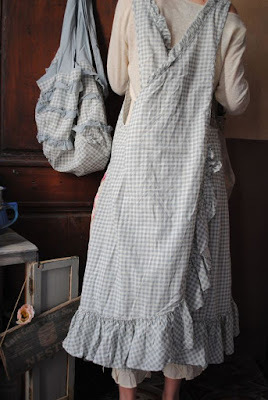 I love to wear aprons daily and the idea of a pinafore is just so country! I love the ciss cross on the back! Great job! Thanks for sharing at Home Sweet Home!